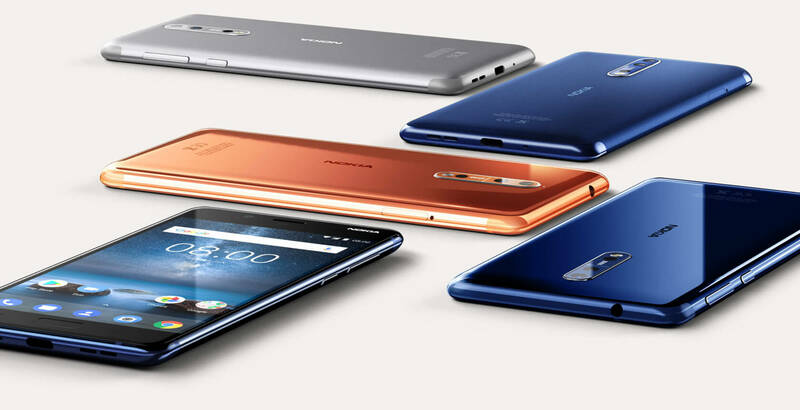 Flagship Nokia 8 phone unveiled, coins the term "bothie"
This has been a very busy year for Android flagship phones. If you're an Android fan, there are definitely no shortage of choices for you to choose from. However, there's one brand that still has some people waiting just a little bit longer to upgrade: Nokia. HMD Global, the company that licensed the Nokia brand to rebuild the company's smartphone portfolio, has finally revealed the Nokia 8 which seems to have the specs and price to compete against the other heavy hitters in the Android smartphone space. First the all important specs: The Nokia 8, like most 2017 flagships, is powered by a Qualcomm Snapdragon 835. It has a 5.3-inch 2560×1440 IPS screen, 4GB of memory, 64GB of storage, and a Carl Zeiss branded dual-camera setup (more on that later). Unlike most 2017 flagships, the Nokia 8 eschews the trend towards thin bezels and includes a fingerprint reader below the display. At the bottom of the device is a USB 3.1 Gen 1 Type-C port for data transfer and charging. Inside is a decently sized 3,090mAh battery which should be good for around a full day of normal use. And yes...there is a headphone jack.There are glossy blue and copper colors, along with matte(!) blue and grey options. Let's go back to that camera though. There are two 13 megapixel sensors on the back—one color, one monochrome—which have optical image stabilization, phase detection autofocus, and a wide f/2.0 aperture. Similar to the iPhone 7, the dual-sensors use their combined data to help improve low light photography, and allow for enhanced depth-of-field tricks such as the "bokeh" effect. However, Nokia is clearly trying to position the Nokia 8 as a content creator's phone. Dubbed "bothie" (technically it's called Dual-Sight), the Nokia 8 has the ability to stream both the front and rear cameras simultaneously. You can even stream straight to Facebook Live or YouTube right from the camera app. The video is automatically split down the middle to show both viewpoints which could be useful in order to see live reactions to some important event. In addition to the "bothie" feature, the Nokia 8 also includes "Ozo Audio" which uses three microphones to capture 360 degree (or binaural) audio for those wearing headphones. The Ozo algorithms used stem from the actual Ozo 360-degree VR camera that Nokia unveiled in 2015. Regarding Android updates, Nokia seems to be committed to making sure customers are covered. Security updates are promised the same day Google releases them and Nokia seems to be delivering on that promise. The Nokia 8 ships with a bone stock version of the latest Android Nougat update with Nokia promising that its phones will be one of the "fastest ways" to get hold of Android O. Though the Nokia 6 is a competent mid-range Android phone, many were holding out for HMD Global to release a true competitor with the likes of the Galaxy S8, LG G6, HTC U11, and the iPhone. With Apple, Samsung, and LG releasing newer phones later this year along with new player Essential in the mix, Nokia is going to have a tough time standing out among the crowd. However, perhaps brand recognition, killer specs, and promise of timely Android updates will be enough for Nokia to rise from the ashes. It will go on sale in Europe in September priced at €600 (around $703), but it’s not clear if this handset will be sold in the United States.